This feels more like a forlorn romance than the usual harem-moe romp that typifies many dating sim adaptations. Continue Reading "WHITE ALBUM 2 – 01"
Those of you who have been following WHITE ALBUM and have been reading my weekly writeups probably know that I haven’t been the biggest fan of the show – partly because of its style, but largely because I don’t care for most of the cast of characters. You may also have heard the announcement that WHITE ALBUM is going to be two seasons long, with the second half airing this fall. Many people saw this news and felt better about the series because it seemed to explain the deliberate pacing, and it meant that they probably weren’t going to rush an ending. For someone like myself, however, whose interest level in the show has dropped as it went on, instead of it being “Well there’s only a few more episodes, I can stick with it for that long just to see the ending,” I’m now faced with 16 more episodes of a series I’m not particularly excited about or even fond of. So I decided there wasn’t any point in me continuing with it and that my time was better spent elsewhere (like catching up with Rideback). My apologies to anyone who was following those posts and does enjoy the show – I hate dropping series, but I just can’t motivate myself to continue with this one. Continue Reading "Concerning WHITE ALBUM"
Touya and Misaki have managed to complete all the costumes and props, but when Misaki brings them in to school to show the members of the drama club, their leader Tamaru insists on monotone colors. Continue Reading "WHITE ALBUM – 09"
After hearing both Rina’s perfect performance and a tape of Yuki’s raw vocals, Touya heads to the roof of the recording studio, and that’s where Rina finds him. Continue Reading "WHITE ALBUM – 08"
Yuki successfully finishes recording her song after Rina advised her to put more spirit into it and promised to take her to a store with delicious cheesecake. 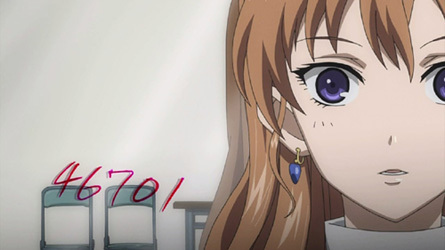 Continue Reading "WHITE ALBUM – 07"
After Misaki informs him about what she has to do for the drama club, Touya calms her down by offering to help her. Continue Reading "WHITE ALBUM – 06"
Touya takes a shower after Yuki does, but by the time he comes out, she’s already asleep. Continue Reading "WHITE ALBUM – 05"
Early one morning, Touya is awakened by a phone call from Rina. Continue Reading "WHITE ALBUM – 04"
First off, Happy Belated Birthday Nana-chan! Despite being fairly knowledgeable about seiyuus and their past roles, I’m not quite obsessive enough to bother remembering their birthdays. Incidentally, I stumbled upon the fact that Nana’s birthday is on January 21st and she just turned 29. Her age makes me wonder if she’s going to tie the knot with anyone soon or if she even has anyone in mind, since she’s nearing the big three O soon. Takahiro Sakurai (Suzaku in CODE GEASS) perhaps? Unlike their North American counterparts though, most Japanese people seem to be so career-oriented that being single at 30 years old doesn’t automatically trigger some sort of mid-life crisis. Interestingly enough, it was Inoue Marina‘s birthday the day before (January 20th, turned 24), Makino Yui‘s the day before that (January 19th, turned 23), and Paku Romi‘s birthday today (January 22, turned 37). I’m not sure what’s up with all the January birthdays, but since they’re all noteworthy seiyuus in my book, best wishes to all of them. Continue Reading "Mizuki Nana – Shin Ai PV (WHITE ALBUM OP)"
On the phone with Touya, Rina asks about the fortune that she brought him, so he explains that it just means she brought Yuki. Continue Reading "WHITE ALBUM – 03"
After getting off the phone with Yuki, Touya is visited by Haruka who wants to go for a walk. Continue Reading "WHITE ALBUM – 02"
The year is 1986, and college student Fujii Touya is in a relationship with a girl named Morikawa Yuki. Continue Reading "WHITE ALBUM – 01"